How about pairing summer’s fresh blueberries with some chicken? 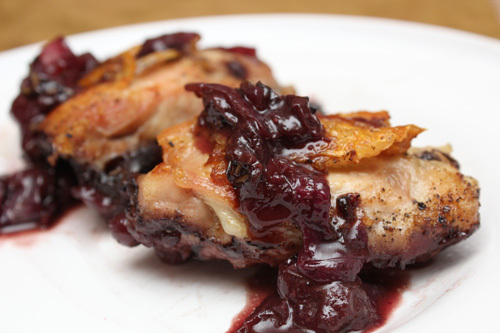 The recipe for “Chicken Thighs with Blueberries and Rosemary,” from In Erika’s Kitchen, convinced me to try it. You know, by now, that I love using just one skillet to cook my meal. And chicken thighs are always winners. The blueberries become jammy when they are cooked down with the butter, onion, white wine, balsamic vinegar, Dijon mustard, and rosemary. This process changes our summer berries into a more wintry sensation -- the berries become heavier. And the rosemary and wine contribute to a deeper flavor. Regardless of summer or winter, we all enjoyed this chicken. In the same-temperature oven (350 degrees), I was able to bake the “Corn Pudding,” from Use Real Butter (she got the recipe from 1995’s The Border Cookbook). Indeed, I’ve made/eaten many of these corny puddings in my cooking past, but the appeal of cornmeal and cheese and buttermilk -- as well as the easy-to-assemble instructions -- are hard for me to ignore. I’m comfortable putting this kind of casserole together. To make it even more ridiculously easy, I used frozen corn kernels rather than fresh. I used coarse grits here, instead of a finer cornmeal. Of course, this affected my texture, but no one minded. And to keep this pudding kid-friendly, I used pickled tomatoes(!) instead of roasted green chiles. No problem. 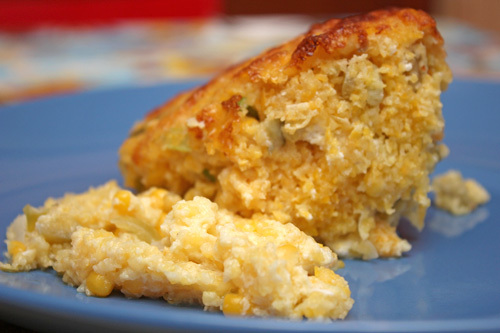 After an hour in the oven, this eggy corn combination becomes an appealing mass. We all ate it, then we all ate some more. It’s that kind of pudding. Next time, I will attempt a quiche/tart with the “Asparagus & Peas Quiche,” from Kiran + Tarun. See what happens when you return to my site next week.